In Chicago, speed was a significant factor in the 3,000 annual crashes between motor vehicles and pedestrians, with children ages 5–18 most likely to be involved in pedestrian crashes. In response, City leaders made a commitment to reduce serious pedestrian injuries by 50 percent every five years and eliminate pedestrian fatalities within 10 years. In Columbia, speeding on local roads was consistently a top issue for area residents. Based on the success of similar efforts in other Missouri cities, in 2009 Columbia ran a pilot program reducing the default speed limit on residential roads from 30 mph to 25 mph. In some neighborhoods, enhanced posted speed limit signs were placed at the entrances of the neighborhood, indicating the lowered speed limit of 25 mph. An educational campaign to promote the slower speeds was also included as part of the program. Speed data from both neighborhoods showed reductions in average speeds, reductions that ranged from roughly 1 mph to over 6 mph on roads where speed limits were changed from 30 mph to 25 mph. The new, kid-friendly signage and the educational campaign did not have a greater impact on lowering speeds than merely lowering the posted speed limit and replacing the standard sign, but residents in the neighborhood that received education reported feeling safer riding bikes and walking on their neighborhood streets than residents in the neighborhood without the educational outreach. The pilot study to evaluate the effect of the speed reduction cost $9,935, and the City used used $128,000 of its traffic safety funds to cover the cost of installation equipment and temporary salaries for two staffers. Pedestrian crashes in New York City are a serious issue, with crashes the second-most common cause of injury deaths among children 5 to 14 years old and among adults over 45. Many of these crashes (21 percent in 2010) can be attributed to speeding. To address this problem, the City began the the pilot Neighborhood Slow Zones program to slow vehicle speeds on residential streets. 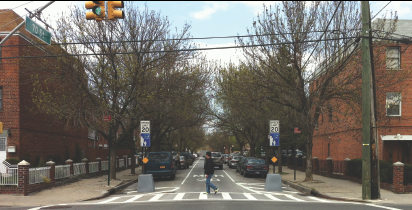 The creation of Neighborhood Slow Zones is led by residents themselves, who must identify a 5-block area for the zone and gather community support in order to apply. While the City received over 100 applications for its first round of funding, requiring broad community support (though helps once application accepted) may hinder the creation of Slow Zones in neighborhoods without community associations or a strong consensus surrounding speeding.